Starting out the day in Atwater, I knew I had to head Northwest, but that meant going through at least one city during a weekday morning rush our. It was either going to be straight West through San Francisco, which would maximize my time on the Pacific Coast Highway, or North through Sacramento, then West. I decided that I didn’t really want to deal with the Bay Area traffic, so headed north to Sacramento on 99. The Traffic was pretty bad, but moved at a decent pace. I even got my first experience with (legal) lanesplitting. Not exactly the most comfortable thing on a bike the size of the VTX, but I can totally see how much a motorcycle would make sense as a true 365 day a year commuter vehicle down here. I stopped for gas just North of the city and mapped out the rest of the day’s route. I headed west on 16 then 20, two roads with really low traffic, great flow, and good road quality. One of the small towns I went through on 20 (I believe it was Nice, Ca) had a “Thank You Firefighters” sign in front of almost every house, about a half mile down the road I saw why. The containment line of the Mendocino Complex Fire was right there, on the road I was riding. The town must have been able to look out at night and see the not too distant hills burning. For miles, I rode along the Southern containment line, everything green and alive on my left, black and scorched on my right. Sobering. I wish I would have stopped to grab a photo, but there wasn’t a good place to pull over. 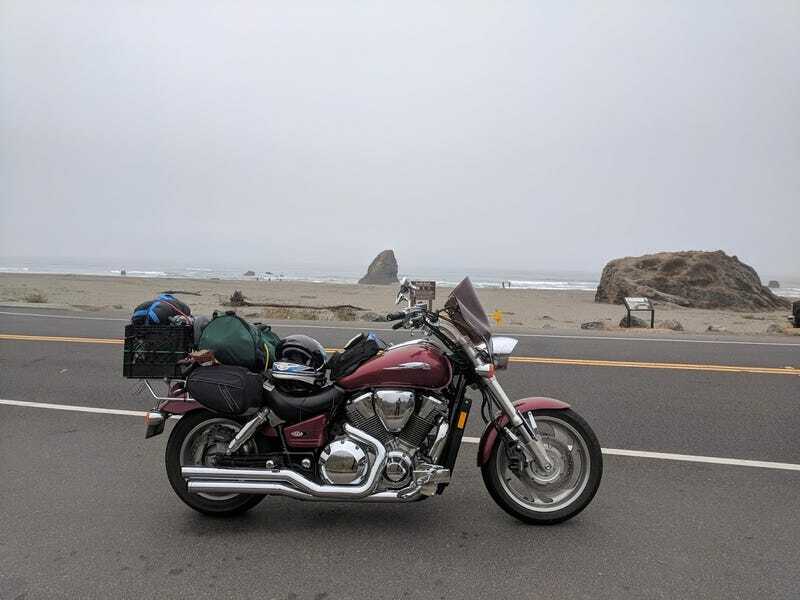 I eventually merged onto 101, which I knew would take me all the way back up to Oregon, but after checking my map, decided to hit 20 westbound and the Northernmost leg of the PCH rather than sticking to 101. The PCH was similar to 20 in terms of technicality, but had enough traffic and great views that I wasn’t riding as near my limit (let’s be honest, it was really the bike’s limit) as I was previously. The road went on for about 40 miles before rejoining 101. After about 70 miles of crazy technical roads my arms were about ready to give out. I had to stop in Garberville for about an hour to rest. This was one of the sections where I really did wish I’d brought a lighter bike. Feeling refreshed after a break and some food, I decided to press northward on 101 and see how far I could get for the day. Decided to call it in Eureka when I felt myself starting to get a little less sharp mentally.